The Designing Your Life workshop is a process-oriented approach, where attendees practice and take home valuable tools for career exploration and development. Careers are ill-defined, “wicked” problems*. To help students and postdocs navigate career paths, an MIT collaboration is contributing an innovative approach. Designing Your Life (DYL) is a career exploration methodology pioneered by Stanford design faculty, recently publicized in the best-selling book by Bill Burnett and Dave Evans. In June, an interdisciplinary team from MIT collaborated with 14 other institutions at Stanford’s first Design Studio for University Educators, with the goal of adapting DYL to serve the MIT community. The team consisted of Jake Livengood (MIT Career Services, GECD), Lily Zhang (Media Lab professional development manager), and Sean Clarke (communication instructor and biotech liaison for the Department of Biological Engineering). Tianna Ransom, career assistant with GECD Pre-Health and Career Services, joined the group in August. The DYL team has led five workshops with students and two staff professional development opportunities thus far, with positive feedback. To date, workshops have been 1 ½ to 2 hours long, and the team is planning more in-depth and recurrent experiences. The Designing Your Life workshop is a process-oriented approach, where attendees practice and take home valuable tools for career exploration and development. Workshops help attendees learn how proven design thinking mindsets like curiosity, bias to action, reframing, and collaboration can help design and test options in the face of the unknown. Participants learn the fundamental process of design thinking, explore the impact of energy on their engagement during a typical week, and develop three different odyssey plans for their next five years. To encourage concrete next steps, they learn how prototyping can help them take action, challenge assumptions, and “sneak up on” their future. 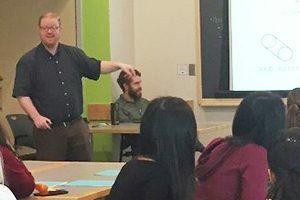 If you are interested in having a DYL workshop with your students, please reach out to Jake Livengood at livngood@mit.edu. *Note: Wicked problems are not “wicked” in a Bostonian sense (like “wicked” bad weather we’re having). Wicked problems have criteria that constantly change, so solutions are very dependent on the context—in this case, one’s career and life path. Because of this shifting environment, one may not know when success is even met, and one’s future can then sneak up on them.